Western House is a family run bed and breakfast situated in the picturesque Gower village of Llangennith. The bed and breakfast is the longest established in the village and offers unpretentious good value. The village is located at the Western edge of the rugged Gower Peninsula. The area is famed for it’s stunning beaches and beautiful scenery. Western House is ideally located in the centre of the village being situated within comfortable walking distance of the local pub and beach. Please take a look at our recent video. Steve and Pippa have lived at Western House for the last 23 years and during this period they have gradually changed the 125 year old traditional Gower farmhouse to suit the needs of guests, with four en-suite bedrooms, two with sea views. 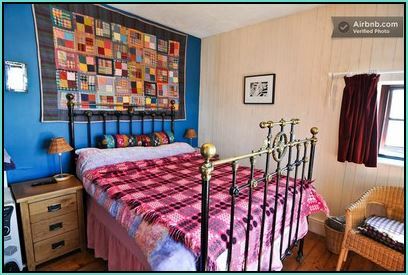 The house has featured in many interior design magazines and its bold and tasteful decor has been influenced by Pippa’s friend the ceramicist Mary Rose Young as well as the designer Kaffe Fassett. There is plenty of off street parking in our yard. Guests are very welcome to use our beautiful beach themed garden, where they can enjoy an evening beer or coffee and by arrangement, use of our Mediterranean BBQ. All of our rooms have flat screen TVs along with complimentary tea & coffee, together with fridge storage. There is also good quality free wifi throughout the property. Each of our guests will receive one of our delicious breakfast options, which includes either a traditional, vegetarian, vegan or continental breakfast. All of our food is locally sourced and all eggs are our freshly laid free range. We have numerous visitors for the nearby growing wedding venues, such as Oldwalls. Local taxis can be arranged on your behalf. We offer a complementary drop off for guests to pick up cars from either Fairy Hill or Oldwalls. Steve and Pippa have an extensive knowledge of local beaches, surf conditions and walks and are only too willing to provide advice and guidance. Please see below a couple of pictures of our rooms. However, please visit the accomodation tab above for further room options. 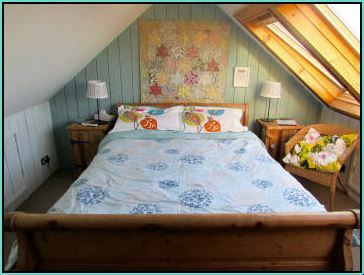 Room charges start at £65 a night, based on two people sharing (off-season). Please note that in peak-season only two night minimum bookings at weekends tend to be accepted, but please still check availability. Well behaved dogs are welcome in certain rooms. Please book online, although telephone reservations can also be made. Payments can be accepted via cheque, PayPal and bank transfer.